However, once the news of Johnson’s massive work became public, it is rumored that even the King (George III, the same “tyrant” of the American Revolution), went to visit him. In the meantime, Johnson had also written what he called “Selected notes on some of the Shakespeare Plays”. In fact, though he abandoned the Shakespeare project, Shakespeare features in many entries of the dictionary. In his preface to the unfinished book on Shakespeare, Johnson says that “he who tries to recommend him (Shakespeare) by select quotations, will succeed like the pedant in Hierocles who, when he offered his house for sale, carried a brick in his pocket as a specimen.” (the pedant in question lived in the II century AD). Which brings me to my book “Your Daily Shakespeare”. Considering Johnson’s verdict on detached, select quotations, I decided to strike a compromise between the pedant in Hierocles and the alternative – which would be having at hand and in mind all the 37 Plays, plus the Sonnets, plus the Poems. a) Including with each entry a description of the context in which the original quotation appears in the play, poem or sonnet. b) Adding suggestions on where, when, how, and with whom to use the quotation. c) A cross-reference to other quotes of similar meaning but with different nuances. d) Adding, on occasions, considerations on specific subjects that may help the user direct his thought towards the lines and the effect he/she wishes to accomplish in his presentation, speech, proposal, letter, document or similar. It took me over 10 years to write “Your Daily Shakespeare”. Apart from the research itself, I struggled for a long time in deciding which would be the format most practical and efficient for the users. Based on their feedback and reports, I am persuaded that I succeeded. Unlike Johnson, however, I had no king visiting me. But it does not matter. No need to crave for the “tide of pomp, that beats upon the high shore of the world“. A particular source of satisfaction is the feedback from readers (and particularly students) – demonstrated by improved grades. One reader actually attributed to “Your Daily Shakespeare” the quotation that enabled him to be hired after a job interview. I then applied the same research and the same format to Dante’s “Divine Comedy”, resulting in the book published by the Government of Tuscany, with the (translated) title, “Your Daily Dante – 3500 ways to get away with it, with Dante”. Here on this site, I published the letter by the Italian Ambassador to the USA, as a sample of similar reactions I had from other readers. This took “only” three years to write. Furthermore… I have developed a very useful and original software application that “marries” the printed with the Internet Shakespeare. And it can be applied very successfully to other disciplines. 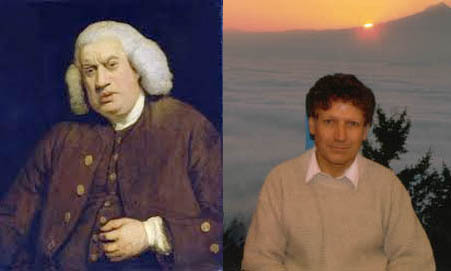 Returning to Dr. Johnson, it would have been wonderful to have met him in person. When he walked through London, he was followed by a group of admirers, armed with pen and notebook, so as to write down immediately what he said. The most persistent of the fans was James Boswell, who collected Johnson’s sayings in his famous, massive and thoroughly enjoyable biography. As for myself, yes, while writing “Your Daily Shakespeare”, like Dr. Johnson with his dictionary, “I toiled at the lower employments of life”, sensing that success would be without the applause (of Academia) and diligence without reward. I like to think that, by extracting, illustrating and bringing out the humor in Shakespeare – whenever applicable – I have contributed something to the readers, by diffusing innocent and rational pleasure. And realising that “The web of our life is of a mingled yarn, good and ill go together: our virtues would be proud, if our faults whipped them not, and our crimes would despair, if they were not cherished by our virtues” (All’s Well That Ends Well” act 3, sc. 3). I feel honored by the unsolicited comments of many readers of my book. And indirectly by the emails I receive related to the articles on this site. But to end with Dr. Johnson – one who, in his dictionary, defines the sales tax as “a hateful tax, levied by wretches” deserves the admiration of all.